This post is sponsored by Catalina Paints Burbank. I was provided paint and supplies for my honest review. All opinions are my own. So, the first step in this process is the easy part…knowing something needs to be done. 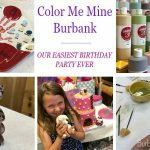 Now, that I am gung ho on making as much of the pink disappear from my 1950’s bathrooms as possible, I headed in to Catalina Paints in Burbank to start working on color selection and supply gathering. I also need to wrap my head around the work in front of me. As I mentioned in Part One of this series, painting projects ALWAYS take longer than you think they will. 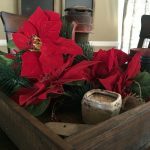 Before I even starting thinking about any of this, I consulted with one of the most highly respected resources on the subject…Pinterest! I didn’t find many “Pink Bathrooms” on there, but what I did find helped me understand I did NOT want to stay in the 1950’s with black as the alternate color in these rooms. Sock Hop I want not. The customer service at Catalina Paints is amazing. A young man named Mike helped me get what I needed, once I selected my color. (FYI..the color I chose was Stone 2112-40, by Benjamin Moore). Mike helped me pick out primer, the right Semi-Gloss paint for the walls and I went with a White Dove Semi Gloss from Catalina Paint for the ceilings. This project has been started and I’m geeked… and I can’t wait to show you pictures. 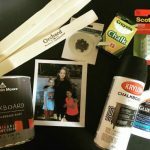 Although the supplies I got are exactly what I needed… some tips I received in a great little booklet are the best things I can share! 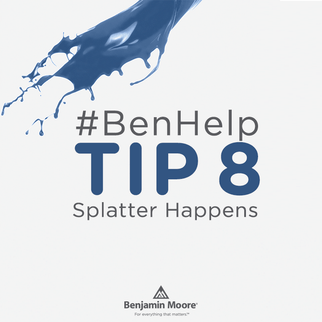 #BenHelp is a really great place to look for questions when starting a DIY Paint Job in or around your home. Search #BenHelp on Twitter to find all of these tips listed below. You’re about to turn your “Before” into a very stylish “After.” But not so fast…don’t forget to snap a “Before” pic so you can share your amazing room makeover with all your friends when you’re done! You have stuff. Some of it may even be nice stuff. You don’t want paint on that stuff. So move it, cover it and you don’t have to worry about it. Don’t forget the floors too. Drop cloths are your friend and try using a clear acrylic sheet to do tough borders on the fly. That should be how the saying goes, anyway. Prep your walls by sanding down any rough patches or lumps first. THen use a slightly dampened sponge to wipe all the dust away (don’t forget the trim). Clean walls ensure that your tape will stick, and that no dust will muck up your pretty paint job. 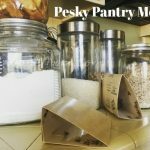 Here is a master taping secret: heat-seal the tapes edge (with friction!) by running a smooth tool like your finger, a spoon or a paint stick along the edge. Heating up the sticky stuff helps it form a stronger seal against paint seepage. You don’t want paint seepage. That lint brush isn’t just for pet hair anymore. Rub it over your paint roller to get rid of pesky excess fuzz so it doesn’t end up painted onto your wall for an eternity. no lint brush? Just wrap your tape around the roller for the same effect. Cleaning is no fun, especially after a day of painting. 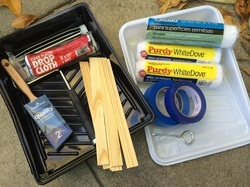 A tray liner makes it easier, but if you don’t have one you can also wrap your paint tray with aluminum foil or a plastic grocery bag (check for holes!). When you’re done painting, you can just wrap up the foil and toss it, leaving a perfectly clean tray. When you dip your brush straight into the can and wipe it against the side, you get messy drips on the can and, eventually, the floor. But here’s a simple trip fighter – a rubber band. Just wrap it around the can, forming a band across the top of the can. Now you can wipe away excess paint without a drip in sight. Paint the edges of a wall first, but only in a manageable section. It’s very important that you always put wet paint on wet paint. Don’t let an area dry around the edges before you paint the middle, or you may be able to see the different layers in your finished paint job. Your ABCs can help your painting technique. Specifically, the W. Make long, Ws with your roller, then go back over them to fill in without picking up the roller. This pattern is perfect for hiding your roller trails on a dried wall. ben* makes painting easy, but it’s still a big job and that can make people a little testy. If you’re painting with a friend ro loved one, remember to have fun and keep cool. If you do snap at them, however, we recommend flowers or some baked goods to smooth things over. Don’t wait to pull your tape. Remove it, preferably while the paint is still wet, downward and at a 45 degree angle. Otherwise, you risk pulling some paint off with the tape, making all your hard work for naught. If that does start to happen, run a sharp blade lightly across the painted edge of the tape before pulling. If you don’t finish the paint job all in one go (hey, we all need the occasional nap break), don’t let your brush or tray dry out. Wrap them super tightly in plastic or foil and seal all edges to keep the air away from them, then store them in your fridge. Don’t eat them. When you’re finished, clean your brushes right away. Hot, soapy water should be all you need, but if they’re especially messy, let them sit in hot vinegar for a half-hour first. Have leftover paint? For a little, soak it up with kitty litter before tossing. For a lot, consider sharing with neighbors, or donate it to the community. Don’t forget to save a little for touch-ups, too. Now that you have a freshly painted space that fits your style, take another photo to be your “after” shot. Now you can show off how big a difference a little bit of color (and a tiny bit of effort) can make in your home. It’s OK to brag. I’ve already put some color on the walls and I cannot wait to share pictures with you!!! Wow…color makes a difference. A HUGE difference. 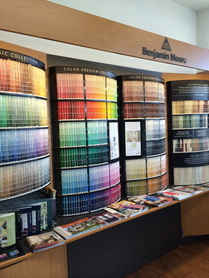 For all your paint supplies and Benjamin Moore and Catalina Paint selections, head over to Catalina Paints in Burbank, located at 1022 W. Burbank Blvd. Burbank, CA 91506. And to find a Catalina Paint near you in SoCal, click HERE. 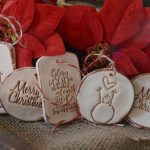 These Easy DIY Salt Dough Ornaments Are A Fantastic Holiday Gift Idea!